According to the United Nations Development Programme, in 2010 there were 41.2 babies born to women aged 15 to 19 for every 1000 women aged 15 to 19 in the United States. This makes the United States rank ninety-sixth out of one hundred ninety-four countries ranked in that category. 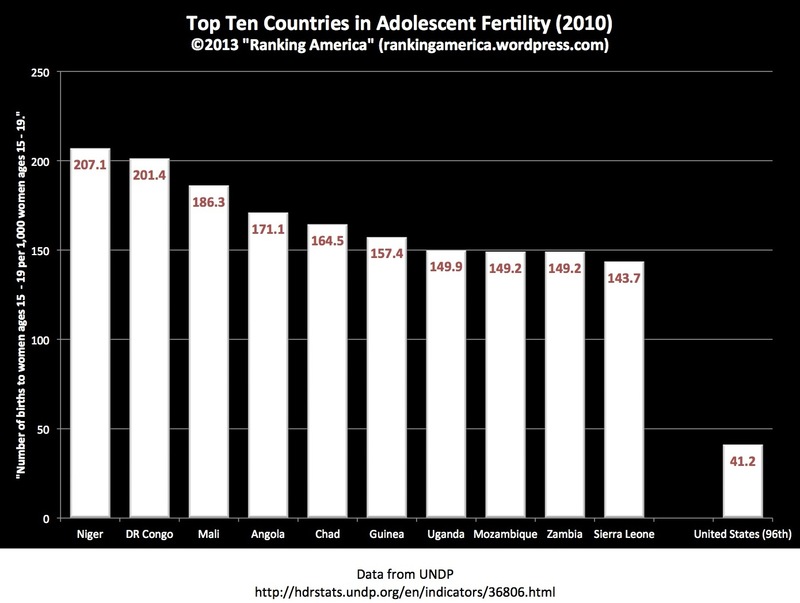 Niger ranks first, with an adolescent fertility rate of 207.1. According to the World Bank, in 2010 the female population in the United States accounted for 50.7% of the total population, which made the United States tied for fifty-ninth in that category with Eritrea, Central African Republic, Myanmar, Zimbabwe, Benin, Mexico, Belize, and the Kyrgyz Republic. Latvia and Ukraine ranked first, with females accounting for 54.0% of their total populations. 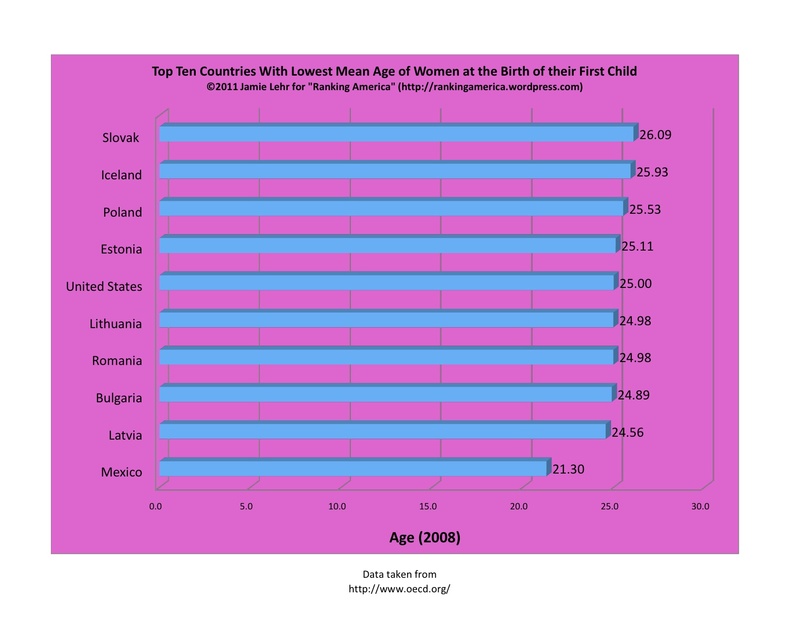 According to the OECD, the United States mean age of women who are having their first child is 25.00 years old. That’s enough for the U.S. to rank sixth in that category. Mexico ranks first with a mean age of 21.30 years old. Mark Rice note: The U.S. does not rank 6th in the world; it ranks 6th among the OECD nations. 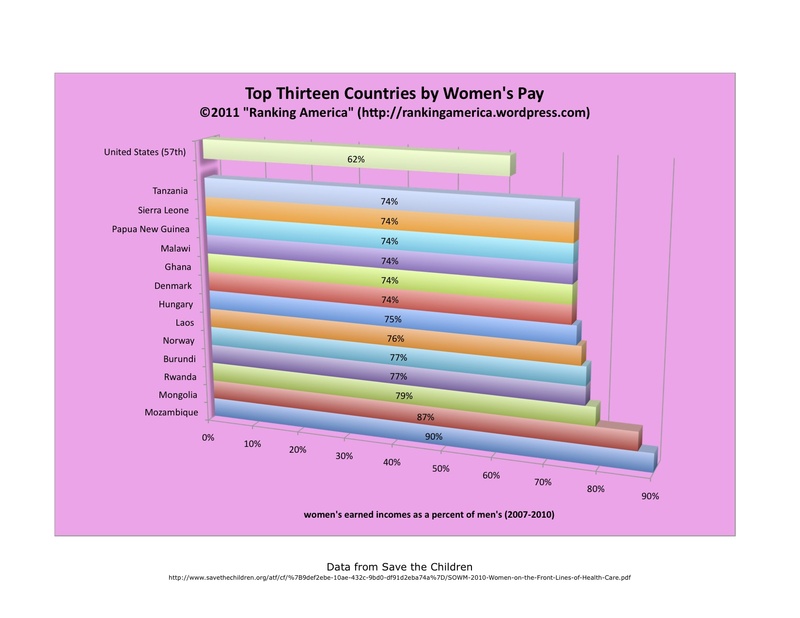 According to Save the Children, in 2010 women in the United States earned, on average, 62% of what men earned, a ratio that makes the United States tied for fifty-sixth (with Switzerland) in that category. Mozambique ranks first, with women earning 90% of what men earned.